Great news for fans of Siobhan's solo singles and their remixes! 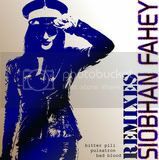 A new download only remix collection has been put together of various tracks from Siobhan's solo singles complete with digital artwork! Go to the shop department of her site to purchase this exciting collection. This is a very good idea for those that are new to Siobhan or those that didn't buy all her records upon release, unfortunately theres nothing here to entice the people that already have all these remixes, not even one new mix? I have all these already so won't be buying it. P.S why is it touted as Siobhan Fahey? It's very confusing....first all the singles are issued under her own name, then the album and It's A Trip' are released as Shakespears Sister...and now back to Siobhan Fahey?? Maybe it's because these are all the old SF mixes, I don't know. They're basically what are on the CD singles why would we buy them again? If they had been new mixes it would have been better. I can't understand why Siobhan is using such old photos to represent herself either, she doesn't look like that anymore, in fact her image for the past 2 years has been quite punk. The photos for the album were from old magazine articles, and the back photo was from a promo photo she sold in her shop years ago. As lovely as they are, I feel she should have used something more current and made it really punky to make a statement of where shes's at now, of course the album's years old too so thats probabaly the design she was using when it was going to be a solo album? The photo on the front is one of her best though. I bought a Cd years ago of her solo album called 'Bad Blood' the sleeve is brilliant, it reminds me of New York street art, the tracks are different to 'Songs From The Red Room' but not vastly.